But first, we get to know them in their native England as, one by one, they emerge from circumstances of their life that are in complete synch with the weather: cold and gray. A woman lost her husband and is forced to sell the apartment to pay off his debt. A couple invested their life savings into a daughter’s start-up and now face “golden years” in a sad flat in a nondescript retirement community, where luxury comes in the form of rails on the walls and a panic button in a corner. There is also a women in a need for an urgent medical procedure that can be done in six month, or right away…but in India. Hope unites them all. Hope of a new life, or less lonely life, hope for a reunion or in one case hope of a new hip. 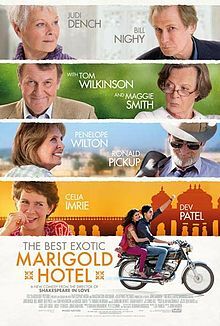 So, they tiptoe to the edge of something startlingly new, promising and adventurous – the Marigold Hotel for the elderly and beautiful. It is not hard to imagine that what they encounter upon arrival is on the edge of acceptable and vastly different from their expectations. Starting with the hotel and ending with India – overwhelming, loud and noisy, beautiful and poor, attacking the senses and any preconceived ideas about how life should look like or unfold. Right at the beginning of this splendid British movie directed by John Madden we learn from Sunny who with astonishing smoothness of an entrepreneurial desperado attempts to shake any remaining British coldness from his newly arrived and demanding guests. “You are all retired and beautiful”, he says. And when they remain unmoved, he adds: in India we have a saying “in the end everything is going to be OK, and if this is not OK, it means it is not the end yet”. Yet the movie stirs right away from what could have been a simplistic comedy for the retired and becomes a meditation on aging, lost chances, new opportunities and hope that is shaped by the urgency of the situation: failing health, awareness of fleeting time and compelling need to make it meaningful or at least less lonely. It is never too late to start anew – is, what we quickly realize, the movie’s message. But in the masterful rendition by an outstanding British cast its message becomes less cognitive, and more visceral, more of our own, it gets under our skin and propels us to act, to create and to explore with no regard for our age, circumstances or location. Because, it is in the openness to life where we find our happiness and fulfillment. One day, we are all going to be elderly, but only some of us beautiful. Thanks for this review. The film is opening in my area on Friday the 18th – I’m fairly certain to see it and review it.